Chanteur Country US né Roger Dean Miller le 15 Octobre 1966 à Los Angeles (Californie). 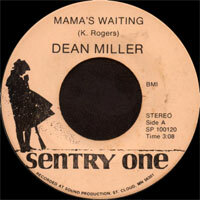 Dean Miller est le fils de Roger Miller. 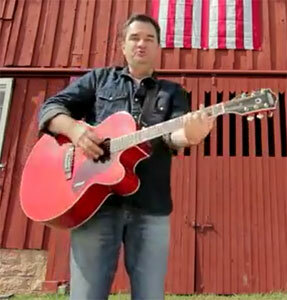 The son of Roger Miller, famed for the perennial "King of the Road", contemporary country singer/songwriter Dean Miller was born in Los Angeles October 15, 1966 but raised in Santa Fe, New Mexico. Launching his performing career as a solo act on the Santa Fe club circuit, he relocated to L.A. in the early 1980s, joining an acoustic unit dubbed the Sarcastic Hillbillies while attending college and pursuing a simultaneous career in acting. Although the band was a popular attraction on the West Coast country scene, Miller's bandmates did not share his enthusiasm for performing, so he recorded a solo demo and moved to Nashville; there he spent half a decade as a staff songwriter at Sony/Tree Publishing followed by two more years under the auspices of Blue Water. Finally, in 1995 Miller signed a recording contract with the Liberty label, issuing his eponymous debut two years later. 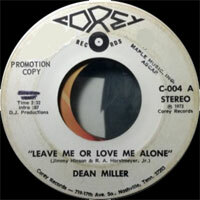 The album didn't sell well and Miller was soon dropped from the label. Another deal with another unnamed label was signed but went nowhere. Miller eventually had to find work outside the music industry but he wasn't giving up. He wasn't going to compromise his art either, and it kept him from inking a deal until the Koch label approached him in 2004. Free to record and release the album he wanted to, Miller got down to business and released Platinum in 2005. 07/1997 SP CAPITOL S7-19648 (US) . 11/1997 SP CAPITOL S7-58682 (US) . 02/1998 SP CAPITOL S7-19896 (US) .